Larry - Gambrills, MD Just a nice replica of a much bigger Goldwing. "I bought this just for fun and to keep my Grandson interested in motorcycles. 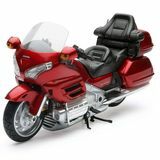 It looks like my own Goldwing except my Wing is platinum instead of red. The model did not come in my bike's colors. It is pretty well done." 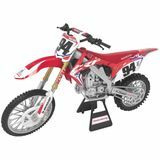 AMANDA 94236 - Michigan Awesome "I love the toy dirt bike I love to collect all my favorite Riders bikes"